iRealHousewives | The 411 On American + International Real Housewives: Kandi Burruss Explains Why She Thinks Her Ex Russell “Block” Spencer Is Using Her Daughter For Publicity! Kandi Burruss Explains Why She Thinks Her Ex Russell “Block” Spencer Is Using Her Daughter For Publicity! Kandi Burruss speaks candidly about the drama with her daughter's father, Russell "Block" Spencer that happening on The Real Housewives of Atlanta and whether she cares if her ex has a relationship with her daughter or not. Check it out below! "I don't hate my daughter's father. 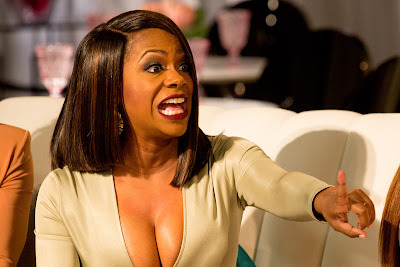 We're not on the best terms but I don't hate him and I don't want us to be doing this while baby mamma, baby daddy drama for the world to see," Kandi told Madame Noire about her ex. "That was never my intent, that's why you've never seen him before." So how did Kandi feel about her ex Russell and his girlfriend Kris Kelli coming to RHOA? "I was kind of pissed off when I first found out that they were coming on and mainly because for the past few years it's been to the point where we don't really talk at all, said Burruss. "I haven't talked to him like a year prior to the day you see her [Kelli] walk into the studio and talk to Riley's dad that long, so when his girlfriend walked up, I'm like: "What? You just gonna pop up in here?"" Kandi then reveals she feels like Block and Kris came on to RHOA to use her daughter for publicity. "I hate to say this because I don't want to be extra or negative but whatever, but I'm like: "Are you using my child for publicity?" that's how I felt," said the songwriter about her ex and his girlfriend. "You an artist, you own a production company, I haven't heard from you, I haven't seen you. You ain't been doing nothing and now you want to show up for the cameras so of course I was angry, I was pissed and I feel like they were using my child."